Corrosion in boiler cycles is caused by the presence of non-condensable gases such as oxygen and carbon dioxide in the boiler feed water. 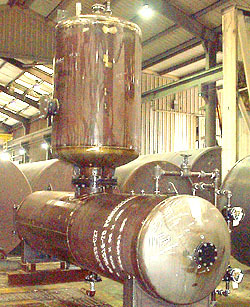 In order to remove the non-condensable gases, the feedwater is heated and vigorously scrubbed by a counter current flow of steam. The incoming undeaerated water enters the deaerator though spring-loaded, stainless steel spray valves. These variable orifice valves produce a fine spray in a uniform pattern from 5% to 200% of design. The fine droplets of water maximize the surface area in contact with steam, raising the temperature to within a few degrees of saturation temperature and instantly releasing the majority of the corrosive, non-condensable gases. The preheated and partially deaerated water flows through the tray stack where the hottest, purest steam vigorously scrubs the water to heat it to saturation temperature and strips the last traces of dissolved gases. 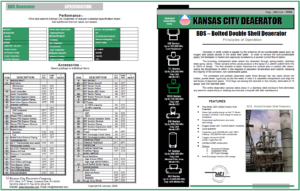 Kansas City Deaerator Company Trays are among the heaviest in the industry, fabricated of 16 gauge, type 430 stainless steel. The entire deaeration process takes place in a stainless steel enclosure that eliminates any need for vessel lining or cladding and ensures a long life with little maintenance. The above capacities are designed for 100% make up. For 50% make up and 50% condensate, increase capacities by 25%. i.e., A model BDS246-6516 would be capable of 250,000 #/hr of 50% make up. © Copyright 2019 Kansas City Deaerator Company. All Rights Reserved.